Purchased your random year Austrian Belgian 20 Franc gold coin through our online store at the lowest price guaranteed! Own a piece of history with this stunning .900 vintage gold coin. With a reign of 44 years from 1865 through to 1909 King Leopold II is the longest serving Monarch in Belgian history. The crowned Royal arms of Belgium in the form of a lion in a striking pose under a crown are displayed as the coins reverse. The coat of arms is surrounded by “L'Union Fair La Force”, or “Unity makes strength” and the coins 20 Franc value. Leopold II's right facing bust is featured on the coins reverse surrounded by the his name, and his title as king of Belgium. Build your wealth in ounces with this unique European collectible coin today! Anverso un retrato de Leopoldo II. Reverso El escudo de armas coronado de Bélgica. un retrato de Leopoldo II. El escudo de armas coronado de Bélgica. Moneda de oro 20 Francos Belgas de Año Aleatorio Purchased your random year Austrian Belgian 20 Franc gold coin through our online store at the lowest price guaranteed! Own a piece of history with this stunning .900 vintage gold coin. With a reign of 44 years from 1865 through to 1909 King Leopold II is the longest serving Monarch in Belgian history. The crowned Royal arms of Belgium in the form of a lion in a striking pose under a crown are displayed as the coins reverse. 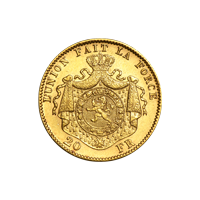 The coat of arms is surrounded by “L'Union Fair La Force”, or “Unity makes strength” and the coins 20 Franc value. Leopold II's right facing bust is featured on the coins reverse surrounded by the his name, and his title as king of Belgium. Build your wealth in ounces with this unique European collectible coin today!